Hold container 6-8 inches from skin or clothing and spray with a slow, sweeping motion. Do not spray in enclosed areas. 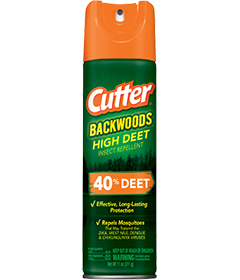 Use just enough repellent to cover exposed skin and/or clothing. Do not use under clothing. Do not spray directly on face. If used on the face, spray on hands first, then apply sparingly to face and ears. Do not apply near eyes and mouth. Avoid overapplication. Do not apply over cuts, wounds or irritated skin. Do not allow children to handle this product. When using on children, apply to your own hands and then put it on the child. Do not apply to children’s hands. • Works on clothing, too: Spray shirts, pants and hats. 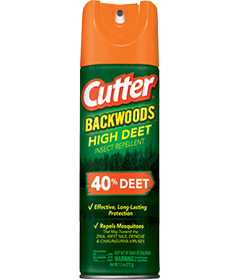 For ticks, chiggers and fleas, apply to tops of socks and around openings of outer clothing. After returning indoors, wash treated skin with soap and water. Wash treated clothing before wearing it again. PESTICIDE STORAGE: Store in a cool, dry place, out of reach of children. CONTAINER DISPOSAL: Do Not Puncture or Incinerate! If empty: Do not reuse this container. Place in trash or offer for recycling if available. If partly filled: Call your local solid waste agency for disposal instructions. Never place unused product down any indoor or outdoor drain. WARNING. Causes substantial but temporary eye injury. Do not get in eyes. Harmful if swallowed. Use of this product may cause skin reactions in rare cases. Wash hands before eating, drinking, chewing gum, using tobacco or using the toilet. Have the product container with you when calling a Poison Control Center or doctor, or going for treatment. For additional information in case of emergency call toll-free 1-800-767-9927. FLAMMABLE. Contents under pressure. Keep away from heat, sparks and open flame. Do not puncture or incinerate container. Exposure to temperatures above 130°F may cause bursting. Do not apply to synthetic fabrics such as acetate, rayon or spandex. Will not damage cotton, wool or nylon. May damage furniture finishes, leather, plastics and painted and varnished surfaces, including watch crystals, guns, bows and automobiles.